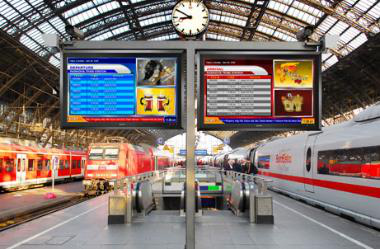 Link to any live data and media feed available to display in your signage. Integrate these real-time text fields to your signage and instantly update messaging without republishing the presentation. Perfect for menu board pricing, waitlists, transportation schedules and more. Keep your signage up to date by linking to and displaying popular news, finance, weather, and sports feeds. Link to social media feeds such as twitter and Flickr to keep your signage relevant and fresh. Connect to virtually any database via MRSS or HTML to display up to the minute details. Perfect for flight timetables, event schedules, corporate statistics, etc. Not sure what product fits your need?